After Abe Fortas resigned in May 1969, there would be no Jewish justice on the court for nearly a quarter of a century, until President Bill Clinton named Ruth Bader Ginsburg to the court in 1993. 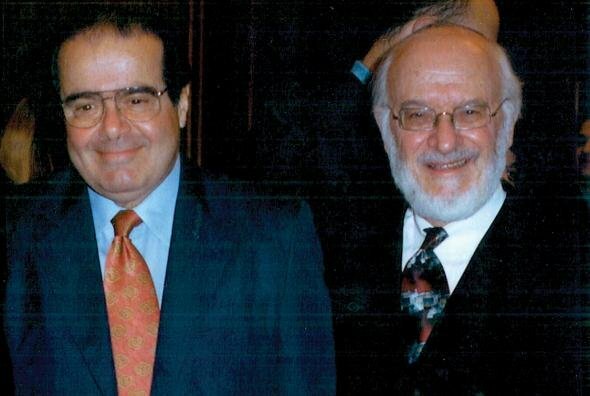 Scalia’s admiration for Jews and Jewish learning explains the frequent references in his opinions to the Talmud and other Jewish sources, and the significant number of Orthodox Jewish law clerks he hired. We became friends again when Scalia was named by Reagan to the U.S. Court of Appeals for the District of Columbia Circuit. In my first appearance before him, Judge Scalia gave my legal arguments a thorough drubbing and wrote the court’s opinion rejecting every legal claim I made-and then some. He did, however, vote to rehear another appellate-court decision that had rejected my constitutional claim for an Orthodox Jewish Air Force psychologist who wore a yarmulke with his military uniform. When he was promoted to the Supreme Court shortly thereafter (which I viewed as appropriate Divine reward because he and Ginsburg both made it to the highest court after they voted with us in the yarmulke case), we revived our law school friendship. Scalia and his wife were guests in our sukkah, and he was kind enough to meet with law school classes I brought to Washington to hear Supreme Court arguments. (Zealously liberal students who claimed not to be able to tolerate Scalia’s judicial philosophy melted into personal fans after they met and spoke with the man. Rather than meeting the cantankerous grouch they were expecting, they saw and heard from a funny, modest, gregarious and intellectually honest judge.) He also accepted my recommendations to attend and address Orthodox Jewish gatherings such as colloquia run by Chabad-Lubavitch, sessions and dinners with Agudath Israel of America, and a mass meeting at Yeshiva University where he and I discussed current issues of constitutional law and public policy. Each event was enormously successful. Some praised Nino’s wisdom; others were ready to stone him. But all must concur that he was a great man, that the United States he loved is greatly diminished by his loss, and that he greatly revered Jews and Jewish tradition.